To those of you who live in La Floresta, a Mexican friend told me today that a tiger had been loose in La Floresta this morning and had killed her friend's dog. I had my friend phone La Floresta security, and they confirmed that this tiger had escaped from someone's house there, but had now been re-captured. They seemed to want to brush it off as nothing to worry about, but I think people should be aware that wild animals are being kept in their neighborhood, and if this can happen once it could happen again. Now that I have seen photos I see it is not a tiger, but is certainly a dangerous large cat! I certainly wouldn't call it nothing to worry about. Tigers are not house pets. Makes me wonder who the neighbors are who own the tiger. Perhaps they are, as we used to say in Boston in mafia days, "connected." That would explain why the La Floresta security people do not want to pursue the owners. That is just amazing - the pinnacle of human arrogance and machismo. I guess Noah started it. I was curious about how widespread this is in Mexico. This org. in Mexico City has already "rescued" 200 big cats.http://blackjaguarwhitetiger.org/ Rescue, to them, means finding households who can bring these cats into their families. Whah!! It least I haven't from those bat crazy wolf dog people in Mexico. There is a story in this week's Reporter about people buying exotic pets, which showed a picture from the Internet of a tiger cub on a leash in the Andares mall. Are we sure this La Floresta thing isn't just a re-telling and twisting of that story? Not a retelling. Our friend who lives there was walking her two collies while it was still loose and was detoured by police or security who described it as a jaguar. Late AM today. In Chiapas jaguars are also called "tigre" in Spanish so hopefully it was a jaguar and not some Bengal tiger or other type of tiger that are really dangerous. Great to hear that someone has a jaguar as a pet when the breed is in danger of extinction..people are pretty incredible. When a Bengal tiger escaped from a circus in Guerrero he went through a bunch of dogs and cows and bulls for the first 2 weeks..never heard what happened to the tigrt or if he ever got caught or killed but that was scary.. These people had a permit to keep this animal. It was near Pranza restaurant, people were running inside. Once the tiger saw the owner he just sat there til they put the collar on the tiger then went home. Something you don't see everyday, pretty cool! Looks like a jaguar, doesn't it? The people with the wildlife center were called out to help catch it. It was tame according to the man who coaxed it home and it is a Jaguar. The wildlife people had a booth at the Chili Cookoff. I found out that it is a federal crime, punishable by over a $200 thousand peso fine to kill any wildlife. That means don't kill any snakes either folks. But what about the OP who said someone's dog was killed by this jaguar? That's horrible, if true. I was told by my friend that two dogs were killed in separate incidents. The owner keeps this Jaguar as a family pet and he was offering to pay any associated doctor bills, or buy them a new dog, etc. ( Ha! like its that easy to replace your beloved pet! ) This Jaguar is very docile normally, according to the owner, but the hunting instinct kicked in when he saw the dogs. I'm told he killed the dogs but didn't eat them. Can you imagine how terrifying that was for the person walking their dog? This poor captive cat should definitely not be allowed in a residential area, or be captive at all, in my opinion. So that makes it ok? That is a jaguar and they are wild animals, we have a few left in the jungle in Chiapas and they are great hunters, tame or not. The poor thing must have been really confused being in La Floresta.. Last year I was walking with friends in the jungle around Tikal with friends and the guide stop and told us to listen. A juaguar was growling really close to us and we never saw it. We waited lokked up and around and it was so well camouflaged we never saw it . They are shy and are not easy to spot so that one must have been scared out of his wit. It is insane that they continue to give permit to keep wild animals in a populated area when it is a big no no to have an howl in a cage..Continuing to issue permits for animals that are in the endangered list only encourages poaching for babies. Holy crap! What a gorgeous Jaguar!!! They should be on the endangered list...not a lap kitty. I was told the jaguar has a dog companion so it knows and likes dogs. If it was out and a dog barked at it frightening it, like any threatened animal it would attack. I have 4 Chihuahuas and they act tough and aggressive toward other animals especially if loose. The jaguar might not have known the Chihuahua was a dog. Never mind the bludy dogs, what about people? no kidding wild animals have strong instincts and this jaguar may have been raised with a dog which does not mean he would not kill a dog if he saw one, not his dog but any dog zipping around would be in danger , more importantly any child or toddler would be in danger too.They rarely attack adults but they could too. Anything running would trigger its hunter´s instinct. These animals are not pets, it just sickens me that people try to reduce them to pets.. Cats are cats and they are wondeful animals but they are hunters period hungry or not. They are magnificent animals and they belong in the jungle, and this one is a reserve not in La Floresta..
Los elementos municipales dudaron en capturar el animal hasta que un joven Bombero dio cuenta que el jaguar era dócil y pudieron mantenerlo quieto a base de caricias. Foto de Gilberto Padilla. Pulsa la fotografía para ver la imagen completa . D. Arturo Ortega (Ajijic, Jal).-Un jaguar escapó de una casa en el fraccionamiento La Floresta de Ajijic y mató a una perrita chihuahua la mañana de este 27 de febrero. El animal en peligro de extinción fue capturado y regresado a sus dueños sin que hiriera a ninguna persona . El jaguar de seis meses de edad de nombre Zoe que se escapó alrededor de las nueve de la mañana de la finca ubicada en Paseo del Lago #97 no atacó a ninguna persona, sin embargo sí mató a una perrita que paseaba con su dueña por la calle Paseo del Lago. El animal en peligro de extinción estuvo deambulando por la mencionada calle (alrededor de las 9:30) por más de media hora, hasta que albañiles quienes trabajaban en una finca cercana al domicilio donde escapó el animal llamaron a las autoridades . Al lugar arribaron elementos de Protección Civil, Servicios Médicos Municipales, Policía Municipal y Secretaría de Movilidad y cerraron la calle. Las autoridades Intentaron levantar a Zoé quien se mostraba amigable con los humanos, para regresarlo con sus dueños, pero no pudieron sino hasta que le dieron trozos de jamón y salchicha para regresarlo a su jaula. Los albañiles entrevistados informaron que la dueña de la perrita chihuahua pateó al gato para que liberara a su mascota, cuando la anciana se dio cuenta que se trataba de un jaguar se retiró de manera cautelosa, resultando ilesa. El ejemplar de gato más grande que se encuentra en América, escapó de su jaula y habría salido por la puerta principal del domicilio en que permanecía cautivo, tras un descuido de sus dueños. El titular de Protección Civil y Bomberos, Enrique Perales Miranda informó que los dueños del felino no se encontraban en el domicilio al momento de la captura. Según dijeron las autoridades el animal no fue incautado por no contar con los recursos para mantenerlo hasta que se aclare la tenencia legal del ejemplar. El departamento de Ecología Municipal agregó que hasta el momento, los dueños no han comprobado la tenencia legal de este y otros animales que se encuentran en la finca. Los cuidadores informaron al departamento de Ecología que los animales que se encuentran en la finca forman parte de un programa de reproducción avalado por Procuraduría Federal del Cuidado del Ambiente (PROFEPA), está última información no ha sido corroborada. Las autoridades no informaron que tipo de animales exóticos se encontraban en el domicilio. Sounds like something the FRAAC Board needs to deal with. A squealing kid with a puppy would be prime prey. Your house cat doesn't eat you because you are too big! As gympichimp said "They seemed to want to brush it off as nothing to worry about",but what if it had attacked a person? It's a miracle it went after the Chi and not after the lady. Jaguars are endangered species and are protected by law and that animal should be impounded by the authorities. 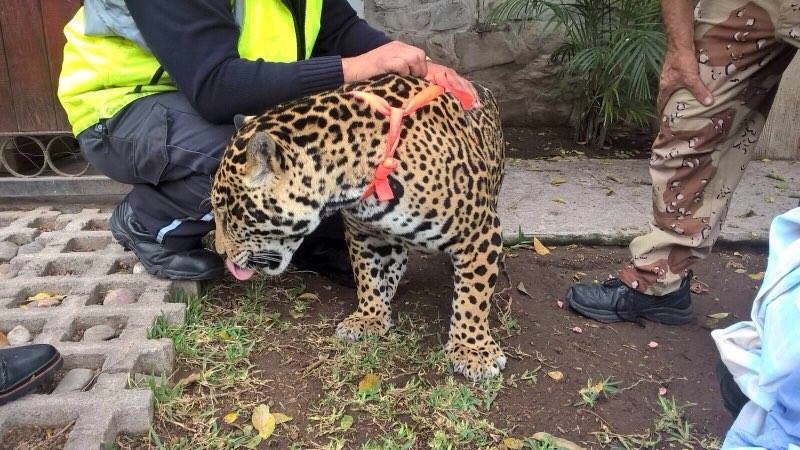 They even took pictures petting the Jaguar as if to show people it was "harmless and innocent", that animal must be the pet of someone with "connections". I wonder what will happen the next time it escapes and roams around La Floresta, I hope it does not atttack a human.